Are Employees Struggling With Alcoholism Protected In The Workplace? News coverage of the former Redskins general manager Scot McCloughan being fired for alcoholism has been rampant over the last month or so, calling into question whether employers can legally fire employees for conditions that can (arguably) be considered disabilities under some circumstances. McCloughan now must decide whether he wants to resort to arbitration in order to recover the $5-$6 million left due to him on his contract, which was cut short by two years. The incident rightfully ignited questions amongst football fans and others regarding whether or not employees like McCloughan can be fired for something like alcoholism, which is classified as a medical condition under some circumstances. Specifically, the Americans with Disabilities Act (ADA) does consider alcoholism to constitute a disability, and protects not only those with the condition, but those recovering from the condition. It also protects individuals recovering from drug addiction. The ADA defines “disability” as a physical or mental impairment that substantially limits one or more of the major life activities of such individual; a record of such an impairment; or being regarded as having such an impairment. In other words, if alcoholism prevents an employee from performing certain tasks in the workplace, their employer may need to accommodate this impairment such that the employee can stay in that job. 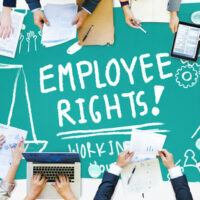 However, it is important to note that the ADA protections often come up against at-will employment, which, in many states, allows employers to fire employees at will. In addition, the ADA does not exempt employees from certain behavioral and performance standards. This is why, if an individual is facing harassment because of their alcoholism, or hasn’t been accommodated, or is blatantly fired for reasons related to alcoholism, they often need to work with an experienced labor law attorney in order to ensure that their legal protections are upheld and their employment contract is honored. Battles can often erupt over whether or not the employee showed up when they were supposed to, whether they submitted the proper medical documentation as evidence of their condition, etc. Battles can often sometimes erupt over the employer providing differential treatment to different employees. This is why it is crucial that employers operate via well-established policies and procedures, lest they open themselves up to labor law litigation. In addition to the ADA, employees seeking treatment are also covered under the Family and Medical Leave Act, which bars employers from terminating employees due to employees taking extended absences in order to obtain treatment for a condition such as alcoholism. Thus, for example, if an employer consistently accommodates an employee who is under the influence of alcohol, for example, but then decides to fire the employee when they try to take time off in order to seek treatment (or treats different employees suffering from alcoholism differently based on favoritism), the employer sets themselves up for serious legal liability under these laws. If you feel you’ve been discriminated against due to your disability, get in touch with us today for a free consultation regarding your rights. Florida ADA attorney Robert Norell has been protecting labor law victims for years in Plantation, Florida and surrounding areas, and we can help you.